The author of Life on the Ground Floor answers eight questions from eight fellow writers. 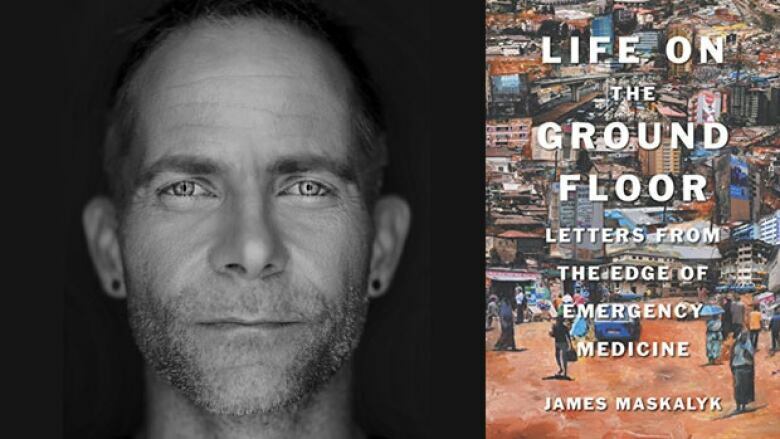 James Maskalyk's memoir Life on the Ground Floor recounts a life spent working in hospital emergency rooms around the world. As a physician, Maskalyk has worked in hospitals as close to home as Toronto and as far flung as Ethiopia, Cambodia and Bolivia. His passionate book chronicles the challenges he has witnessed in each of these places, and is now a finalist for the 2018 RBC Taylor Prize. Life on the Ground Floor is on the Canada Reads 2019 longlist. The final five books and the panellists defending them will be revealed on Jan. 31, 2019. The 2019 debates are happening on March 25-28, 2019 and will be hosted by Ali Hassan. Below, Maskalyk takes the CBC Books Magic 8 Q&A and answers eight questions from eight fellow authors. 1. Sandra Perron asks, "Why write this book now?" As far as I know, while there are books that evoke the many stories found within an emergency room, there are few that deliberately attempt to capture the spirit, the "why" of the place, and with Ethiopia, so new in its attempts to do it, it was a perfect chance to draw the reader into centre of why it matters. Further, they deserve every support. 2. Alison Hughes asks, "Which one experience, person or place has had the most influence on your writing?" The first plane ticket I bought myself. It was to Santiago, Chile, between my first and second year of medical school. It woke me to the difference between here and there, culture and inequity. The latter became the focus of my career, led to Médecins Sans Frontières (MSF), the hospital I work at in Toronto and the subject of my writing. I feel that we have so much room to go before we know the depth of our humanity, there seems nothing else to write about. 3. Stephen Bown asks, "Do your first draft manuscripts come in too short or too long?" Too long, but not by much. As the aphorism goes, if I had more time, my books would be shorter. The last process is always ruthless editing of my favourite parts. 4. Saleema Nawaz asks, "What's the best response you've ever had from a reader?" My friend Jehan told me that while reading Six Months in Sudan he missed not just one subway stop, but a few. When people tell me they read it in one sitting, then I know I have fulfilled the primary responsibility of a writer, at least from my perspective: to grip a reader's attention. 5. Michael Winter asks, "Do you have a window you can see out of when you write, or do you purposefully write up against a blank wall?" I look out a window, like a caged canary. It creates a fine thread of sorrow and lament that I can tap into at any time. 6. Chevy Stevens, "Is there another genre or style of book you would like to write? Why haven't you?" Apocalyptic fiction. I haven't yet because it appears the book is writing itself. 7. Eden Robinson asks, "What was the most unexpected inspiration you've ever had?" My patients. I thought medicine in Canada was a means for me to fund a life where I confronted poverty and conflict elsewhere, but over the past several years, I realize work just as deep can be found wherever I am. There is no day that I don't find a person who floors me with her determination or insight. It has become this great privilege to be both physician and witness to the beauty and challenges of living. 8. Colleen Murphy asks, "What is the book you read that changed your life, and why?" Every book changes my life, as reader or writer, even ones I put down because I can't stand them. At least I know the books I don't want to write. I would say that Toni Morrison's Beloved knocked me on my back, taught me that one can write ghost stories that are works of art. Huston Smith's History of the World's Religion affirmed for me that with the right view, all wisdom traditions share a core of humility and love for the deep mystery of aliveness that binds our cells together, us to each other.